While the processing vocabulary of Akka Streams is quite rich (see the Streams Cookbook for examples) it is sometimes necessary to define new transformation stages either because some functionality is missing from the stock operations, or for performance reasons. In this part we show how to build custom processing stages and graph junctions of various kinds. The GraphStage abstraction can be used to create arbitrary graph processing stages with any number of input or output ports. 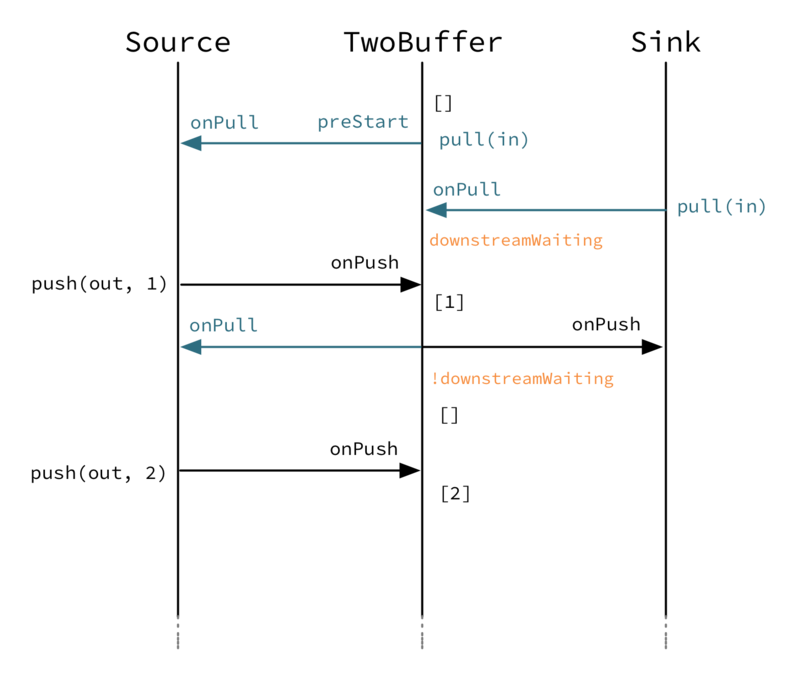 It is a counterpart of the GraphDSL.create() method which creates new stream processing stages by composing others. Where GraphStage differs is that it creates a stage that is itself not divisible into smaller ones, and allows state to be maintained inside it in a safe way. // never inside the enclosing GraphStage. As you see, in itself the GraphStage only defines the ports of this stage and a shape that contains the ports. It also has, a currently unimplemented method called createLogic. If you recall, stages are reusable in multiple materializations, each resulting in a different executing entity. In the case of GraphStage the actual running logic is modeled as an instance of a GraphStageLogic which will be created by the materializer by calling the createLogic method. In other words, all we need to do is to create a suitable logic that will emit the numbers we want. It is very important to keep the GraphStage object itself immutable and reusable. All mutable state needs to be confined to the GraphStageLogic that is created for every materialization. Similarly, to create a custom Sink one can register a subclass InHandler with the stage Inlet. The onPush() callback is used to signal the handler a new element has been pushed to the stage, and can hence be grabbed and used. onPush() can be overridden to provide custom behaviour. Please note, most Sinks would need to request upstream elements as soon as they are created: this can be done by calling pull(inlet) in the preStart() callback. // This requests one element at the Sink startup. push(out,elem) pushes an element to the output port. Only possible after the port has been pulled by downstream. complete(out) closes the output port normally. fail(out,exception) closes the port with a failure signal. 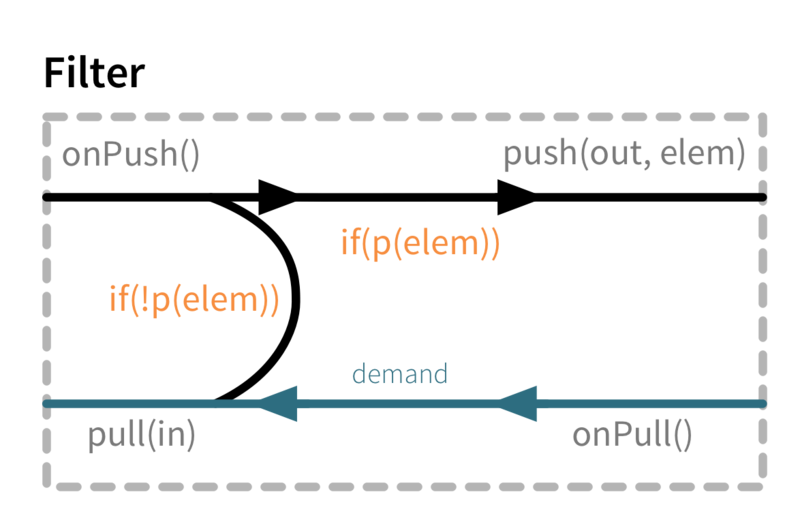 onPull() is called when the output port is ready to emit the next element, push(out, elem) is now allowed to be called on this port. onDownstreamFinish() is called once the downstream has cancelled and no longer allows messages to be pushed to it. No more onPull() will arrive after this event. If not overridden this will default to stopping the stage. isClosed(out) returns true if the port is closed. At this point the port can not be pushed and will not be pulled anymore. 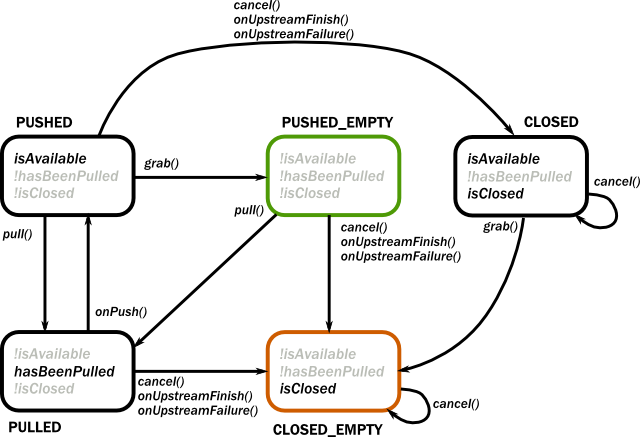 The relationship of the above operations, events and queries are summarized in the state machine below. Green shows the initial state while orange indicates the end state. If an operation is not listed for a state, then it is invalid to call it while the port is in that state. If an event is not listed for a state, then that event cannot happen in that state. pull(in) requests a new element from an input port. This is only possible after the port has been pushed by upstream. grab(in) acquires the element that has been received during an onPush(). It cannot be called again until the port is pushed again by the upstream. cancel(in) closes the input port. onPush() is called when the input port has now a new element. Now it is possible to acquire this element using grab(in) and/or call pull(in) on the port to request the next element. 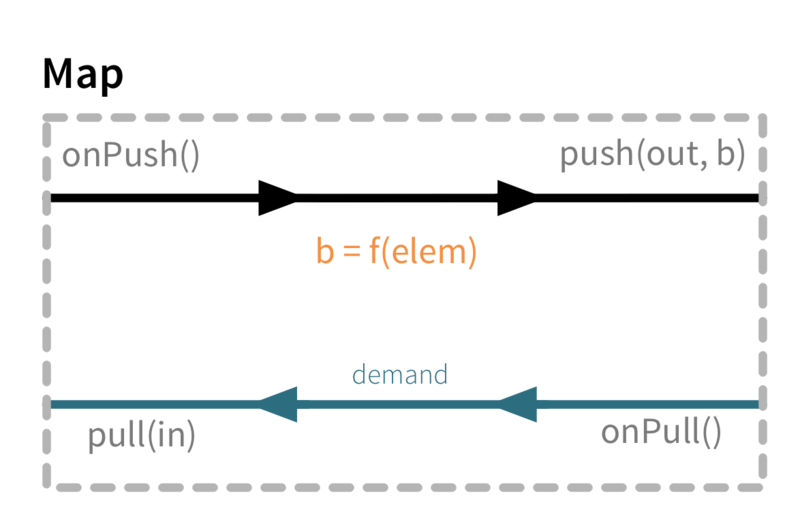 It is not mandatory to grab the element, but if it is pulled while the element has not been grabbed it will drop the buffered element. onUpstreamFinish() is called once the upstream has completed and no longer can be pulled for new elements. No more onPush() will arrive after this event. If not overridden this will default to stopping the stage. onUpstreamFailure() is called if the upstream failed with an exception and no longer can be pulled for new elements. No more onPush() will arrive after this event. If not overridden this will default to failing the stage. isAvailable(in) returns true if the port can be grabbed. hasBeenPulled(in) returns true if the port has been already pulled. Calling pull(in) in this state is illegal. isClosed(in) returns true if the port is closed. At this point the port can not be pulled and will not be pushed anymore. completeStage() is equivalent to closing all output ports and cancelling all input ports. failStage(exception) is equivalent to failing all output ports and cancelling all input ports. In some cases it is inconvenient and error prone to react on the regular state machine events with the signal based API described above. For those cases there is an API which allows for a more declarative sequencing of actions which will greatly simplify some use cases at the cost of some extra allocations. The difference between the two APIs could be described as that the first one is signal driven from the outside, while this API is more active and drives its surroundings. read(in)(andThen) and readN(in, n)(andThen) replaces the InHandler with a handler that reads one or more elements as they are pushed and allows the handler to react once the requested number of elements has been read. An example of how this API simplifies a stage can be found below in the second version of the Duplicator. Graph stages allows for custom linear processing stages through letting them have one input and one output and using FlowShape as their shape. Such a stage can be illustrated as a box with two flows as it is seen in the illustration below. Demand flowing upstream leading to elements flowing downstream. To illustrate these concepts we create a small GraphStage that implements the map transformation. Map is a typical example of a one-to-one transformation of a stream where demand is passed along upstream elements passed on downstream. As we see above, if the given predicate matches the current element we are propagating it downwards, otherwise we return the “ball” to our upstream so that we get the new element. This is achieved by modifying the map example by adding a conditional in the onPush handler and decide between a pull(in) or push(out) call (and of course not having a mapping f function). This is a stage that has state: an option with the last element it has seen indicating if it has duplicated this last element already or not. We must also make sure to emit the extra element if the upstream completes. In this case a pull from downstream might be consumed by the stage itself rather than passed along upstream as the stage might contain an element it wants to push. Note that we also need to handle the case where the upstream closes while the stage still has elements it wants to push downstream. This is done by overriding onUpstreamFinish in the InHandler AbstractInHandler and provide custom logic that should happen when the upstream has been finished. If we attempt to draw the sequence of events, it shows that there is one “event token” in circulation in a potential chain of stages, just like our conceptual “railroad tracks” representation predicts. Completion handling usually (but not exclusively) comes into the picture when processing stages need to emit a few more elements after their upstream source has been completed. We have seen an example of this in our first Duplicator implementation where the last element needs to be doubled even after the upstream neighbor stage has been completed. This can be done by overriding the onUpstreamFinish method in InHandlerAbstractInHandler. Stages by default automatically stop once all of their ports (input and output) have been closed externally or internally. It is possible to opt out from this behavior by invoking setKeepGoing(true) (which is not supported from the stage’s constructor and usually done in preStart). In this case the stage must be explicitly closed by calling completeStage() or failStage(exception). This feature carries the risk of leaking streams and actors, therefore it should be used with care. Logging debug or other important information in your stages is often a very good idea, especially when developing more advanced stages which may need to be debugged at some point. The helper trait akka.stream.stage.StageLogging is provided to enable you to easily obtain a LoggingAdapter inside of a GraphStage as long as the Materializer you’re using is able to provide you with a logger. In that sense, it serves a very similar purpose as ActorLogging does for Actors. You can extend the akka.stream.stage.GraphStageWithLogging or akka.strea.stage.TimerGraphStageWithLogging classes instead of the usual GraphStage to enable you to easily obtain a LoggingAdapter inside your stage as long as the Materializer you’re using is able to provide you with a logger. Please note that you can always simply use a logging library directly inside a Stage. Make sure to use an asynchronous appender however, to not accidentally block the stage when writing to files etc. See Using the SLF4J API directly for more details on setting up async appenders in SLF4J. SPI Note: If you’re implementing a Materializer, you can add this ability to your materializer by implementing MaterializerLoggingProvider in your Materializer. It is possible to use timers in GraphStages by using TimerGraphStageLogic as the base class for the returned logic. Timers can be scheduled by calling one of scheduleOnce(key,delay), schedulePeriodically(key,period) or schedulePeriodicallyWithInitialDelay(key,delay,period) and passing an object as a key for that timer (can be any object, for example a String). The onTimer(key) method needs to be overridden and it will be called once the timer of key fires. It is possible to cancel a timer using cancelTimer(key) and check the status of a timer with isTimerActive(key). Timers will be automatically cleaned up when the stage completes. Timers can not be scheduled from the constructor of the logic, but it is possible to schedule them from the preStart() lifecycle hook. In order to receive asynchronous events that are not arriving as stream elements (for example a completion of a future or a callback from a 3rd party API) one must acquire a AsyncCallback by calling getAsyncCallback() from the stage logic. The method getAsyncCallback takes as a parameter a callback that will be called once the asynchronous event fires. It is important to not call the callback directly, instead, the external API must call the invoke(event) method on the returned AsyncCallback. The execution engine will take care of calling the provided callback in a thread-safe way. The callback can safely access the state of the GraphStageLogic implementation. Sharing the AsyncCallback from the constructor risks race conditions, therefore it is recommended to use the preStart() lifecycle hook instead. they are not location transparent, they cannot be accessed via remoting. they cannot be returned as materialized values. they cannot be accessed from the constructor of the GraphStageLogic, but they can be accessed from the preStart() method. There is no built-in synchronization of accessing this value from both of the thread where the logic runs and the thread that got hold of the materialized value. 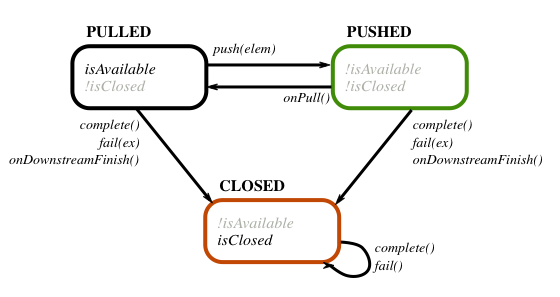 It is the responsibility of the programmer to add the necessary (non-blocking) synchronization and visibility guarantees to this shared object. Stages can access the Attributes object created by the materializer. This contains all the applied (inherited) attributes applying to the stage, ordered from least specific (outermost) towards the most specific (innermost) attribute. It is the responsibility of the stage to decide how to reconcile this inheritance chain to a final effective decision. See Modularity, Composition and Hierarchy for an explanation on how attributes work. Sometimes it is desirable to decouple the rate of the upstream and downstream of a stage, synchronizing only when needed. This is achieved in the model by representing a GraphStage as a boundary between two regions where the demand sent upstream is decoupled from the demand that arrives from downstream. 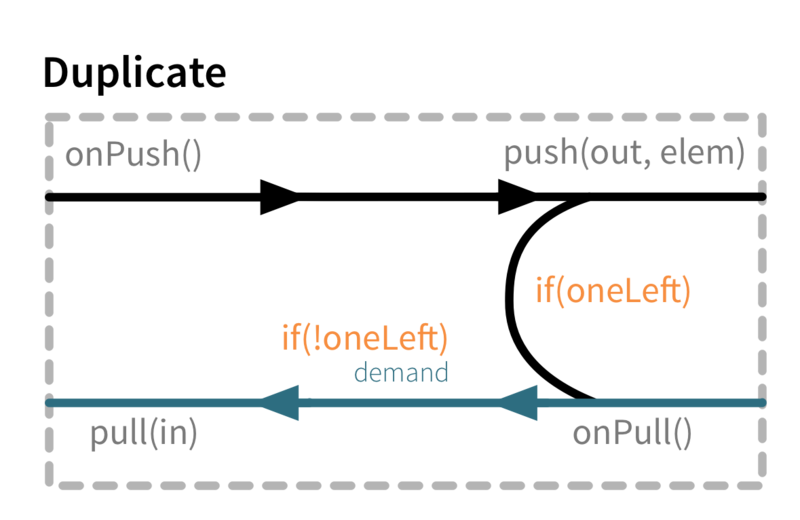 One immediate consequence of this difference is that an onPush call does not always lead to calling push and an onPull call does not always lead to calling pull. One of the important use-case for this is to build buffer-like entities, that allow independent progress of upstream and downstream stages when the buffer is not full or empty, and slowing down the appropriate side if the buffer becomes empty or full. The next diagram illustrates the event sequence for a buffer with capacity of two elements in a setting where the downstream demand is slow to start and the buffer will fill up with upstream elements before any demand is seen from downstream. Another scenario would be where the demand from downstream starts coming in before any element is pushed into the buffer stage. 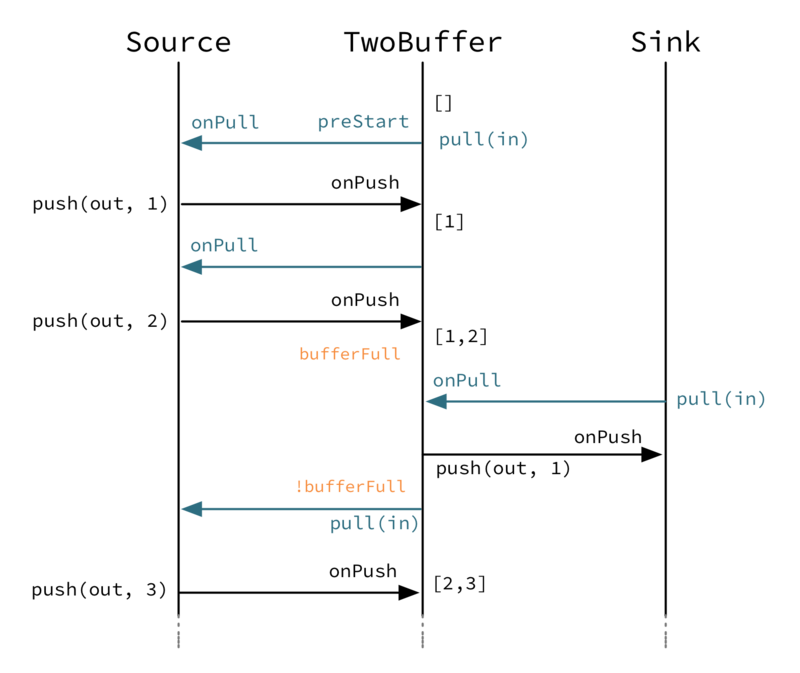 The first difference we can notice is that our Buffer stage is automatically pulling its upstream on initialization. The buffer has demand for up to two elements without any downstream demand. The following code example demonstrates a buffer class corresponding to the message sequence chart above. All of the above custom stages (linear or graph) provide a few simple guarantees that implementors can rely on. The callbacks exposed by all of these classes are never called concurrently. The state encapsulated by these classes can be safely modified from the provided callbacks, without any further synchronization. In essence, the above guarantees are similar to what Actor s provide, if one thinks of the state of a custom stage as state of an actor, and the callbacks as the receive block of the actor. It is not safe to access the state of any custom stage outside of the callbacks that it provides, just like it is unsafe to access the state of an actor from the outside. This means that Future callbacks should not close over internal state of custom stages because such access can be concurrent with the provided callbacks, leading to undefined behavior. If a stage manages a resource with a lifecycle, for example objects that need to be shutdown when they are not used anymore it is important to make sure this will happen in all circumstances when the stage shuts down. Cleaning up resources should be done in GraphStageLogic.postStop and not in the InHandler and OutHandler callbacks. The reason for this is that when the stage itself completes or is failed there is no signal from the upstreams or the downstreams. Even for stages that do not complete or fail in this manner, this can happen when the Materializer is shutdown or the ActorSystem is terminated while a stream is still running, what is called an “abrupt termination”. The most general way of extending any Source, Flow or SubFlow (e.g. from groupBy) is demonstrated above: create a graph of flow-shape like the Duplicator example given above and use the .via(...) combinator to integrate it into your stream topology. This works with all FlowOps sub-types, including the ports that you connect with the graph DSL. Advanced Scala users may wonder whether it is possible to write extension methods that enrich FlowOps to allow nicer syntax. The short answer is that Scala 2 does not support this in a fully generic fashion, the problem is that it is impossible to abstract over the kind of stream that is being extended because Source, Flow and SubFlow differ in the number and kind of their type parameters. While it would be possible to write an implicit class that enriches them generically, this class would require explicit instantiation with all type parameters due to SI-2712. For a partial workaround that unifies extensions to Source and Flow see this sketch by R. Kuhn. If you try to write this for SubFlow, though, you will run into the same issue as when trying to unify the two solutions above, only on a higher level (the type constructors needed for that unification would have rank two, meaning that some of their type arguments are type constructors themselves—when trying to extend the solution shown in the linked sketch the author encountered such a density of compiler StackOverflowErrors and IDE failures that he gave up). It is interesting to note that a simplified form of this problem has found its way into the dotty test suite. 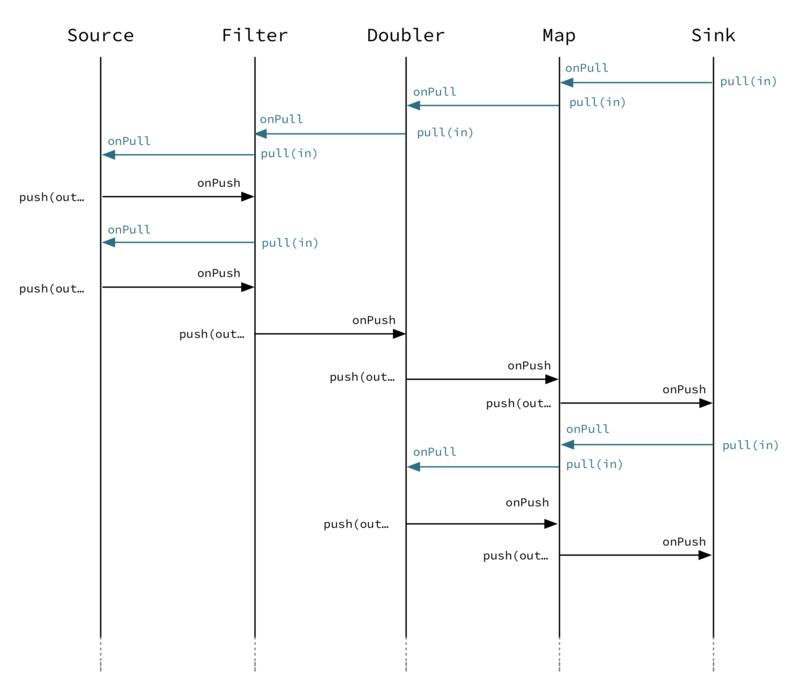 Dotty is the development version of Scala on its way to Scala 3.